A $46.2 million renovation and expansion of Washington Park is shaping up as one of those transformational projects that help push a neighborhood on the rebound even further. Throughout the first decade of the 21st Century, Cincinnati has seen just this happen with the renovation of Fountain Square downtown. Now as Over-the-Rhine continues to open new residences and businesses, projects like the Cincinnati Streetcar and the renovation and expansion of Washington Park may finally push the long-troubled neighborhood into wide-reaching prosperity. The Washington Park project will include a $21.6 million, two-level underground parking garage that will lie beneath a 2-acre expansion of the park to 14th Street. The completed 500-space underground parking garage will mirror designs often found in dense European cities and that found at Fountain Square in downtown Cincinnati where an underground garage is integrated underneath the public space. One of the major sticking points with the overall project has circled around the financing to make it happen. At the Cincinnati Center City Development Corporation's (3CDC) OTR Work Group meeting last week, officials secured nearly $21 million of the total $46.2 million needed to complete the project, with the remaining $25.2 million identified and pending approval. 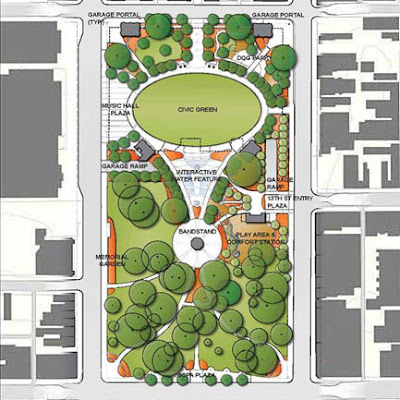 Music Hall Plaza sits in front of the new Civic Green at the expanded Washington Park [TOP]. The new interactive water feature integrates a new element to the historic park in place of the pool that once sat next to the elementary school [BOTTOM]. Images provided. The renovation of Washington Park will also create a central gathering space directly across the street from Music Hall's main entrance on Elm Street called the Music Hall Plaza. 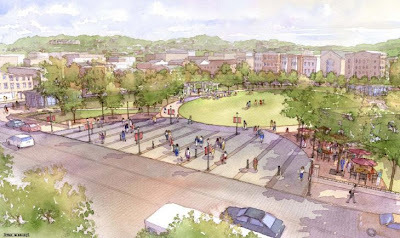 Music Hall Plaza will then flow directly east into a newly created civic lawn space that will cover roughly the size of a football field. On the south side of the Civic Lawn a new water feature will be created that will lead all the way to the park's historic bandstand. The historic bandstand centrally located in Washington Park will be restored and "modernized for contemporary use" according to officials at 3CDC. 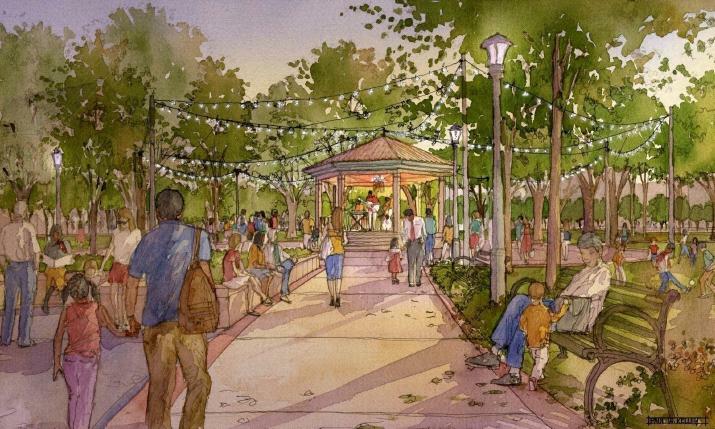 Those enhancements will include audio/visual upgrades and the addition of a dramatic new lighting canopy encompassing the area surrounding the bandstand. The historic bandstand will be upgraded and include a dramatic new lighting scheme [LEFT]. The $46M project will transform and expand one of Cincinnati's oldest parks [RIGHT]. Images provided. 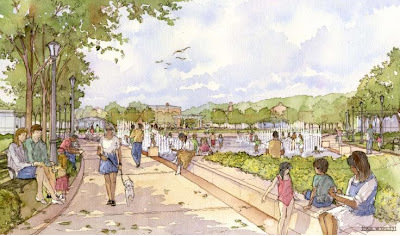 One of the more anticipated features of the newly renovated Washington Park is a roughly 1/4-acre dog park to be located immediately west of the historic bandstand along Elm Street. The dog park will add a second dog park to Cincinnati's under-served urban core that has been experiencing tremendous population growth over recent years in both people and dogs. 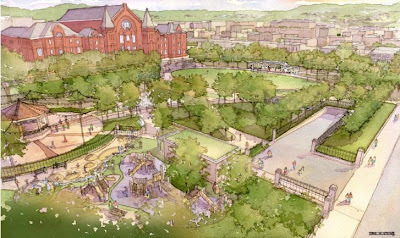 Officials are finalizing the financing components and designs now and hope to begin construction work by summer 2010. Should construction begin at that point, a fall 2011 completion date is targeted.